Learn how to cook this delicious vegetable soup – without a stove and just a simple touch of a button! That’s right, no more kitchen patrol duties or over-boiling anxieties, just plug in your rice cooker. So just sit back, relax and wait for a bowl of “lang tong” (beautiful soup) that will make your mother proud. Grate carrots & potatoes and chop them up evenly. Cut Tomatoes and Corn into two. Pour all chopped ingredients into the rice cooker, along with the shitake mushrooms and add 2L of water. 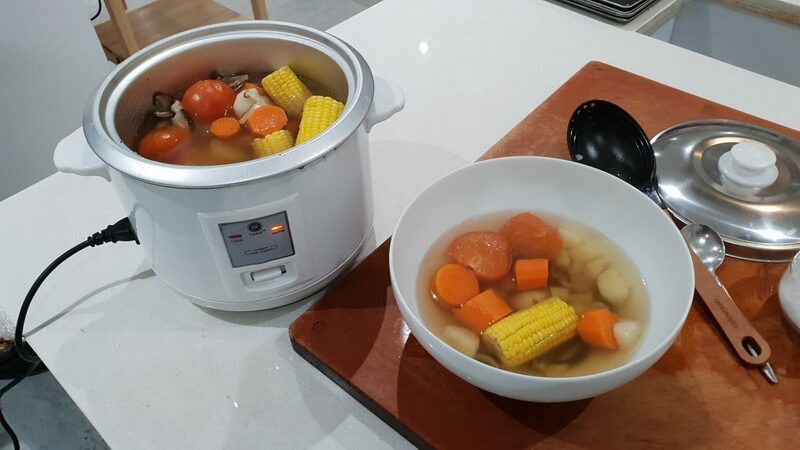 Close rice cooker and set to cook mode for 1 to 1.5 hours. Salt & Pepper after for taste.